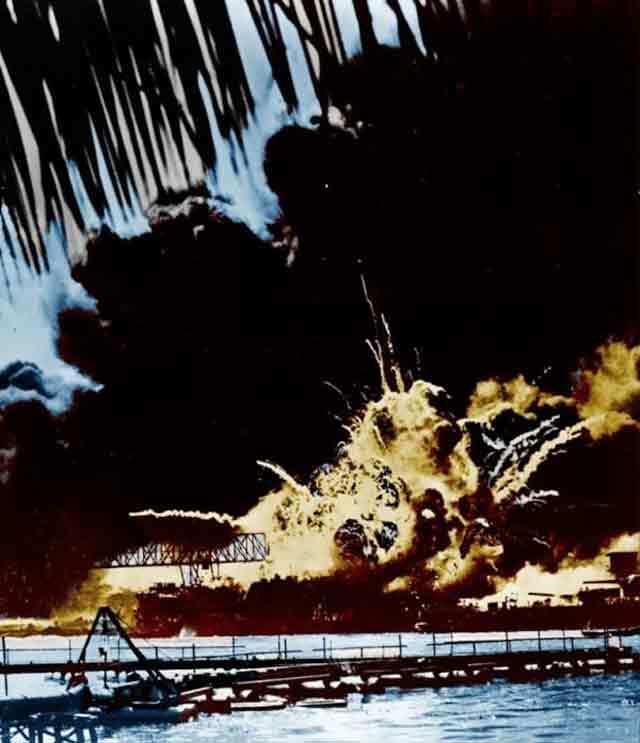 On this page, we have color photos of the Japanese attack on Pearl Harbor on 7 December 1941. 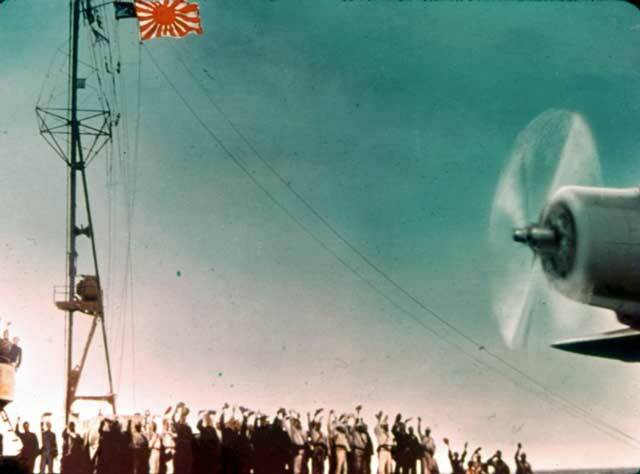 All of these photos are from original photographs. 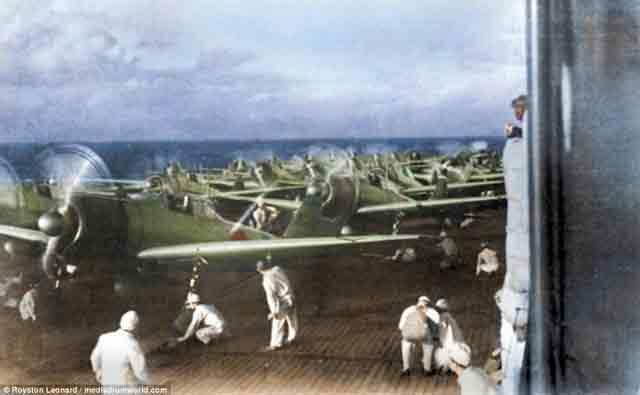 Some (not all) have been colorized. The rule followed is that any colorized photograph must be taken from an original photo and must attempt to accurately reflect reality. 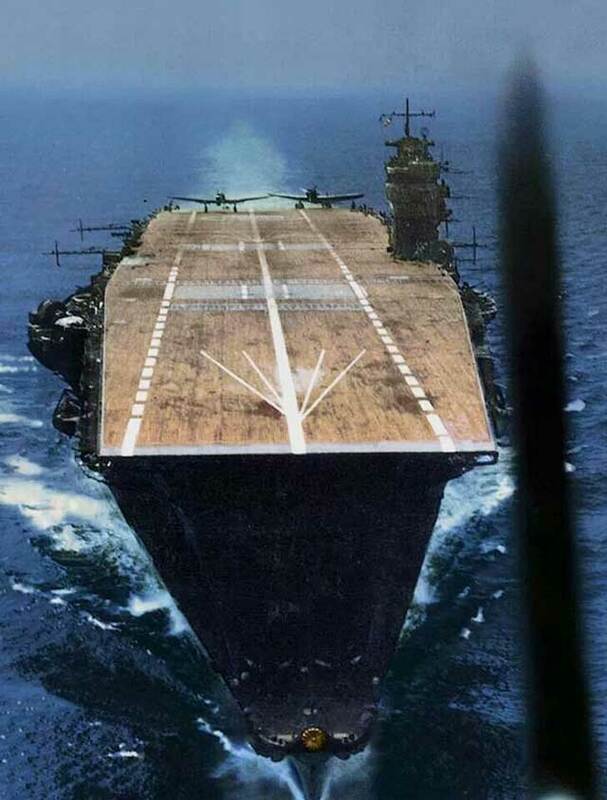 The Japanese main carrier strike force, Kido Butai, sailed from Japan in late November. In early December, the final signal to launch the strike as planned was received by the fleet. 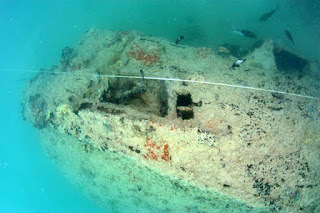 The ships sailed to within about 225 miles of Oahu and then launched their planes exactly as planned without being observed by anyone. IJN aircraft carrier "Akagi" the flagship of the strike force that attacked Pearl Harbor, in April 1942. “Imperial Japanese Navy Submarine Ha201. 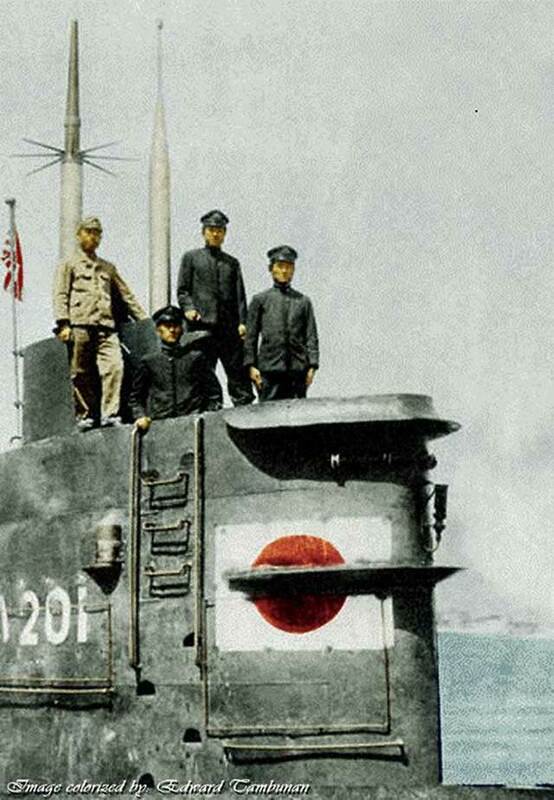 There were many Japanese submarines in the water off Pearl Harbor. The US Navy found one just before the attack and sank it. The Japanese fleet first launched two floatplanes for reconnaissance purposes and to make pinpoint the location of the United States fleet. 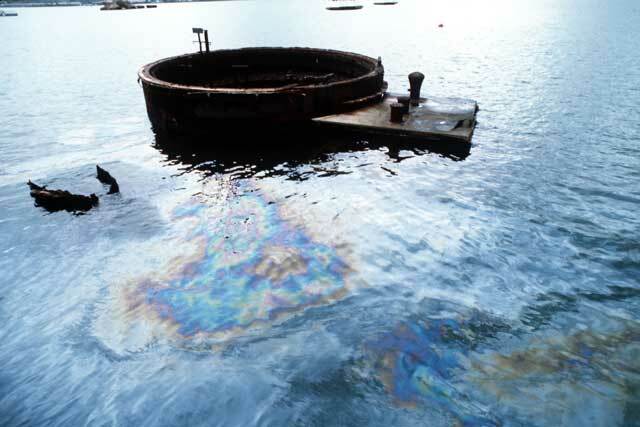 They remained unobserved even though they flew within five miles of Pearl Harbor itself. The Japanese attack consisted of two waves. 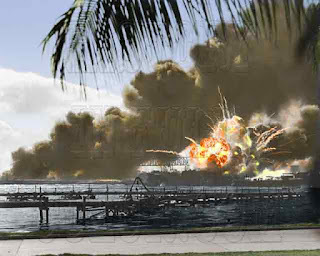 The first wave made its attack at 07:55 on 7 December 1941, local time. 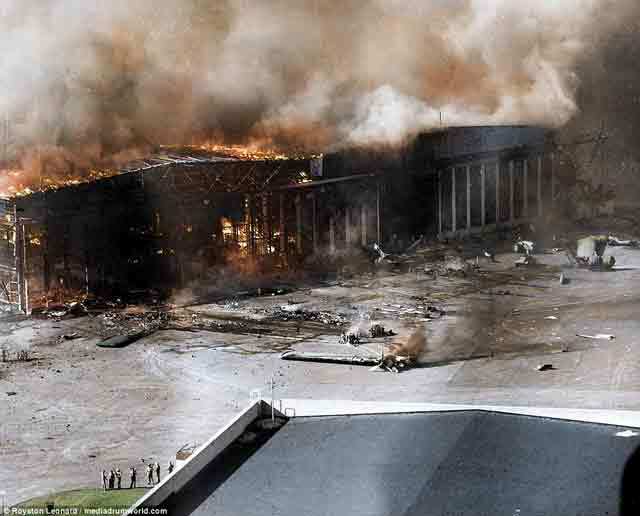 The first message of the attack was received in Washington, D.C. about five minutes later. 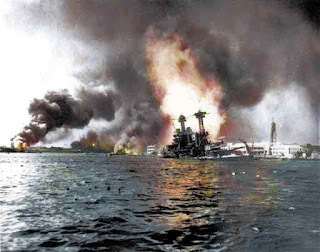 The Pearl Harbor Attack only lasted for an hour or two as Admiral Nagumo, the Japanese commander, considered the risk of additional strikes too great. 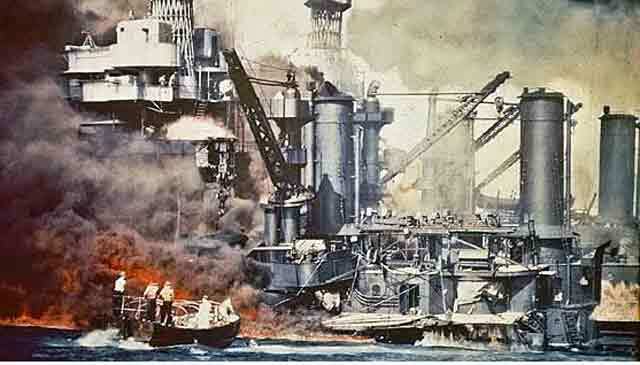 However, Pearl Harbor was devastated. 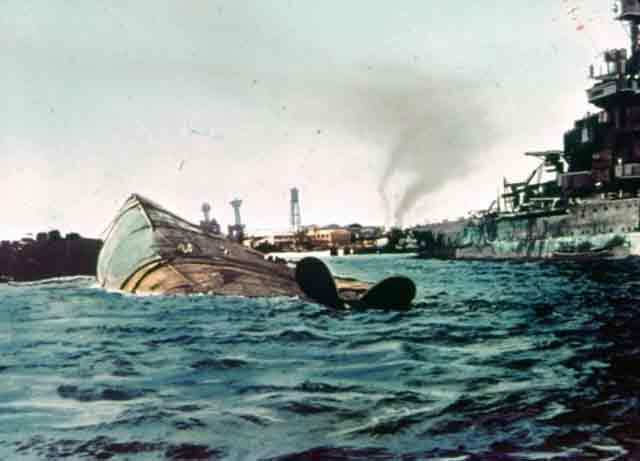 Attempts to free trapped sailors in half-submerged ships continued for days. 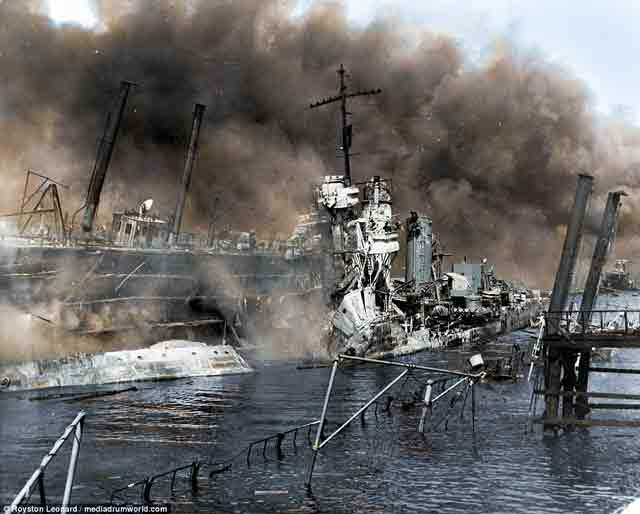 Sailors and airmen recalled scenes of devastation well into 1943. The US government kept the full details of the attack secret for many years so as not to provide useful intelligence information to the Empire of Japan. The US Congress voted for war on the Empire of Japan on 8 December 1941. 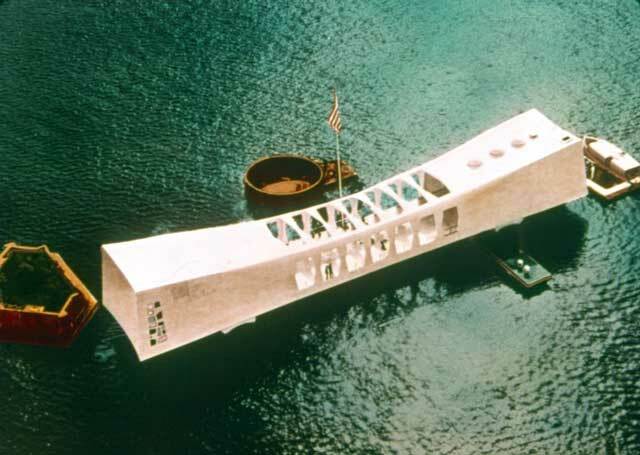 Many individuals contributed to the funding of the Arizona Memorial. 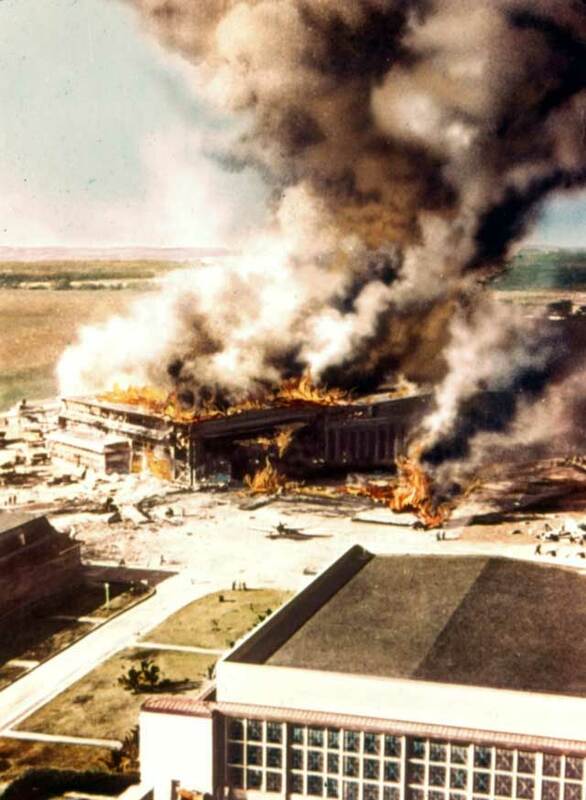 Among them was Elvis Presley, who held a benefit concert at Bloch Arena to raise money for the Arizona Memorial. This concert raised over $64,000, which was more than 10% of the final cost. Elvis was not paid for the concert and donated additional funds in addition to the $64,000. 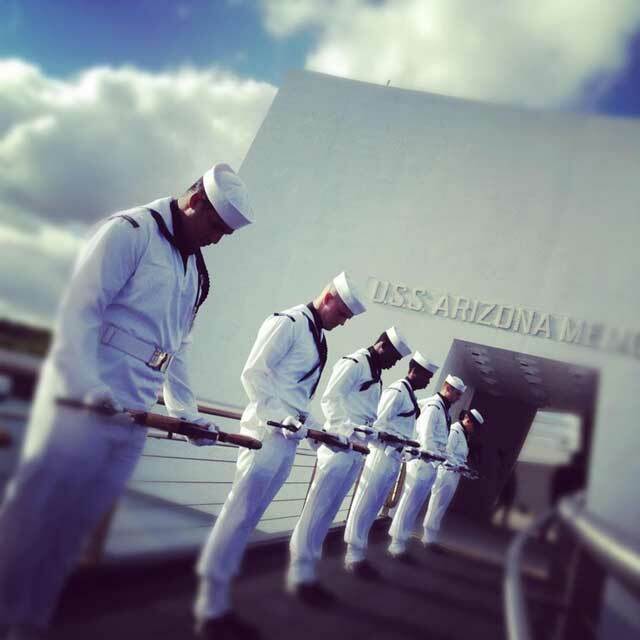 The concert was on March 25, 1961, and the Arizona Memorial was dedicated on May 30, 1962. 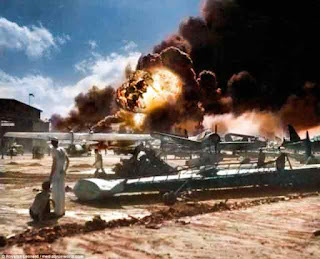 The photograph above was taken at the Albion Park Raceway, Breakfast Creek, Brisbane, on 27 December 1943. 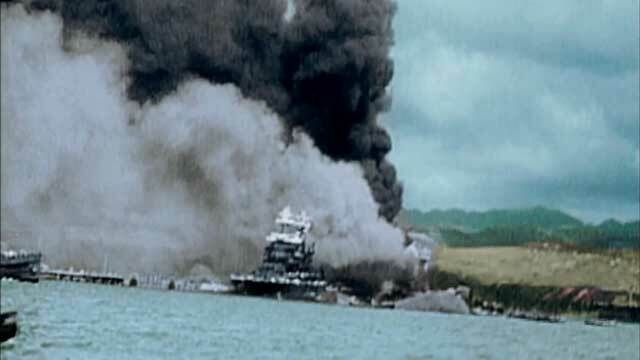 The intersection of John Wayne (Marion Morrison, actually, but we’ll go with “John Wayne” because that is how we remember him) and World War II brings out a lot of emotions at times. There is a lurking accusation that Wayne was a draft-dodger. It is indisputable that John Wayne never entered the military. It is said that Wayne got into a few altercations with servicemen during the war regarding his non-enlistment. So, this issue has been around for a long time. Let's address this question head-on and see if we can reach any conclusions. John Wayne on the set of "The Big Trail" (1930). John Wayne was never drafted even when he was eligible for the draft. Thus, at the most basic level, John Wayne was not a draft-dodger. 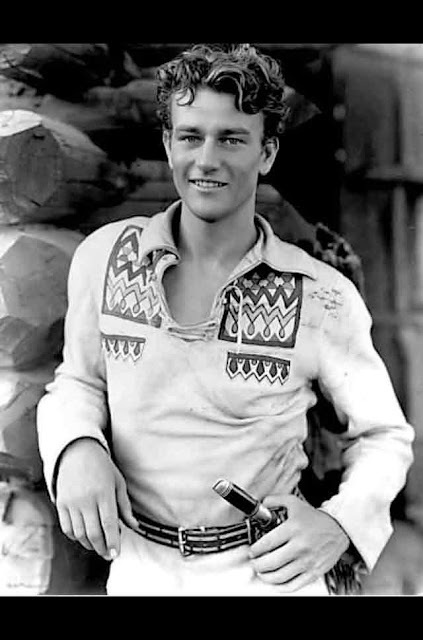 Okay, that direct response won’t satisfy anyone, or at least the people who like to disparage John Wayne. So, let us go a bit deeper. In the classic meaning of the term, to be a "draft-dodger" means that you were drafted but went to Canada or faked some disability. Put simply, to avoid the draft, you have to be drafted. If you aren’t drafted, there is nothing to avoid. Incidentally, some other celebrities who later liked to pose as big patriots such as Ted Williams actually did try to avoid the draft after receiving their draft notices (Williams failed, though, and wound up in the service anyway). The draft board gave Wayne a family deferment and classified him as 3-A. That was not Wayne’s decision to make, and he never received a draft notice. Later, after being reclassified as A-1, Wayne did not receive a draft notice. John Wayne “avoided” nothing. John Wayne, and his first wife, Josephine Wayne, with actor Spencer Tracy at El Mirador in Palm Springs, California, in January 1934. Okay, that isn't going to satisfy everyone either. Let’s take this a step further. 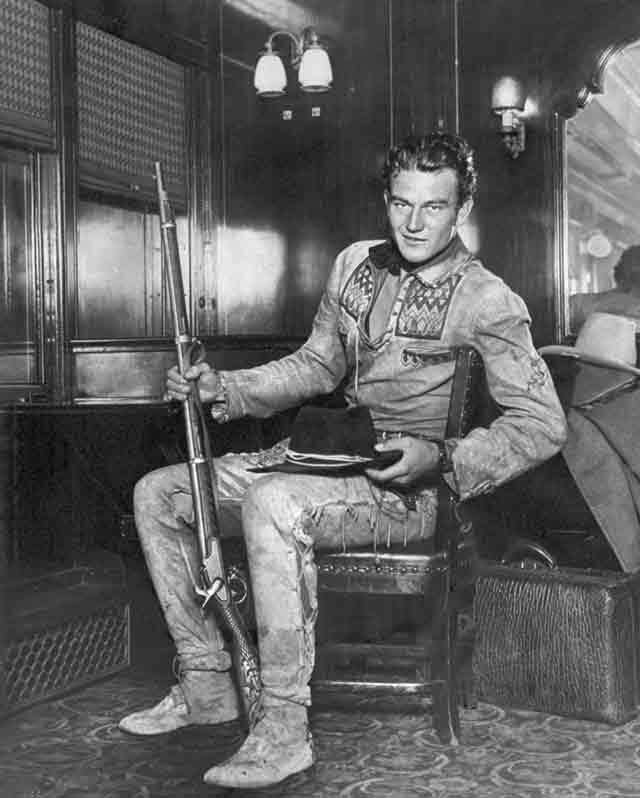 Since John Wayne was never drafted, that sends the argument to a distinctly lower level: that he used his influence to avoid getting a draft notice in the first place. That seems to be the underlying slur against John Wayne. However, it has one big problem: there is no evidence to support this. People who claim that Wayne pulled strings to avoid serving simply use the fact that he did not serve as the proof. It is a circular argument. There is no evidence that John Wayne made any calls or wrote any letters or had any meetings to avoid being drafted. None. 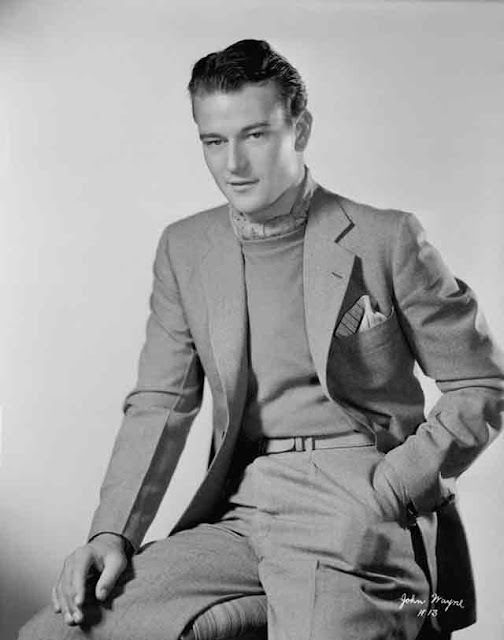 John Wayne's first wife, Josephine, later claimed that Wayne did everything that he could to avoid being drafted because he was having an affair with Marlene Dietrich. One must always take an ex-wife's reminiscences with a grain of salt. There is evidence that Wayne did have a three-year affair with Dietrich, but none that this affected his draft status. The Selective Training and Service Act of December 20, 1941, made all men between the ages of 20 and 44 liable for military service, and required all men between the ages of 18 and 64 to register. 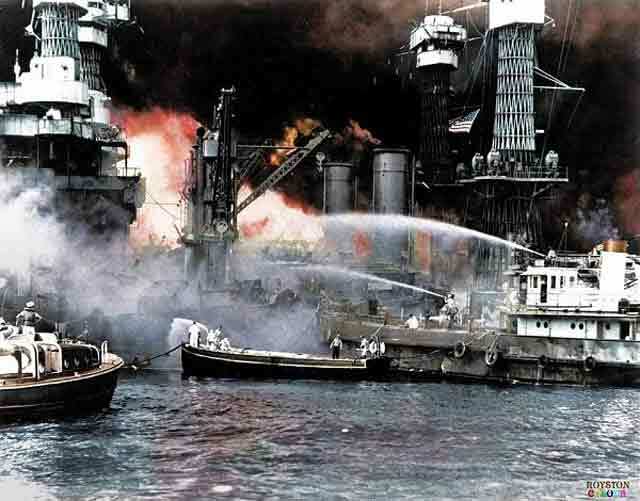 Wayne also was 34 by the time that World War II broke out, so he was liable for the draft. Wayne registered for the draft, but was not selected. So, that answers the question completely. 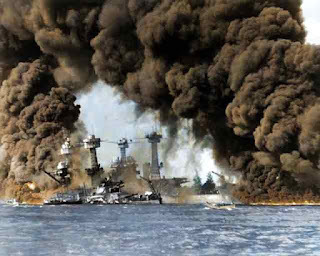 John Wayne did not deliberately do anything to avoid serving in World War II. Period. Case closed. 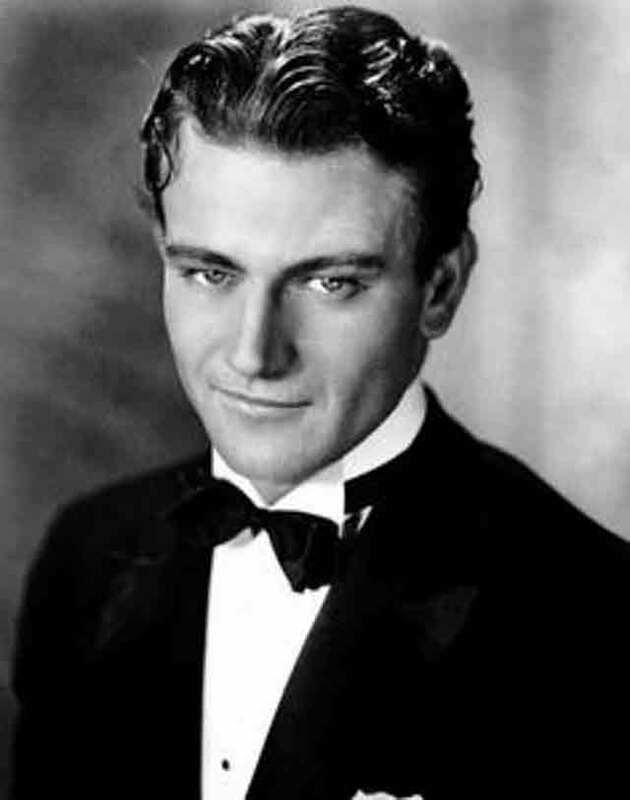 John Wayne promo picture, 1930. That still won’t satisfy some folks, so let’s look at the background. There is evidence that Wayne did, in fact, try to sign up by appealing to certain officials - though admittedly he did not try too hard. Wayne could have just walked down to the local recruiting station and signed his name on the dotted line. Clark Gable, grieving over the death of Carole Lombard, did that. John Wayne did not do that. This is probably the thing that irks people about John Wayne’s lack of military service and the worst slur that you can legitimately throw at him in this area. 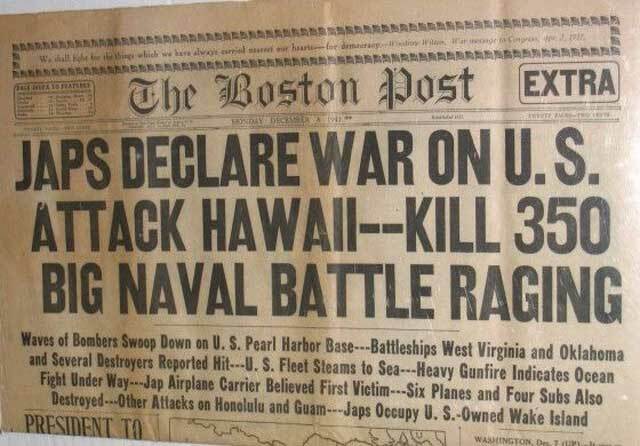 Just for context, some other big Hollywood stars other than Gable also enlisted despite their right not to. Henry Fonda, for instance, was 37 at the time and had a wife and three children. He received the same deferment as Wayne. Fonda undoubtedly could have stayed out of the military, but he chose to enlist and was accepted. That was Fonda's choice, and he made it. Jimmy Stewart, a year younger than Wayne, was rejected by the draft board for being underweight and bulked up until he finally was accepted. 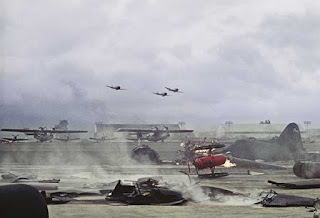 So, there was no general effort by Hollywood stars to stay out of the military. 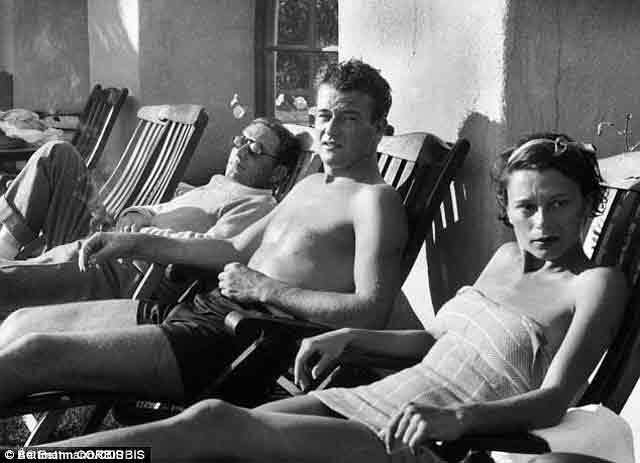 Fonda's, Stewart's, and Gables' decision prove that the option was there for John Wayne to at least try to enlist. Obviously, many other non-celebrities couldn't wait to enlist and did everything they could to sign up. John Wayne did not. 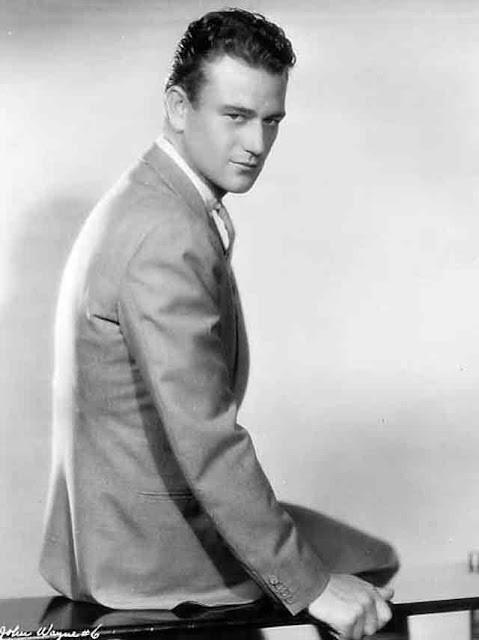 An undated John Wayne promo photo ca. the 1930s. 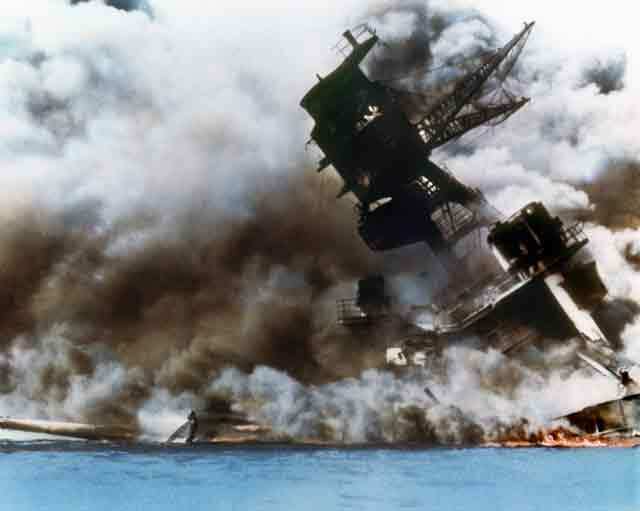 To be realistic, however, Wayne likely wouldn’t have been able to enlist even if he had gone down and signed his name. He had a number of lingering injuries dating back to his college days, some quite recent, such as a 1941 ear problem that alone likely would have disqualified him. 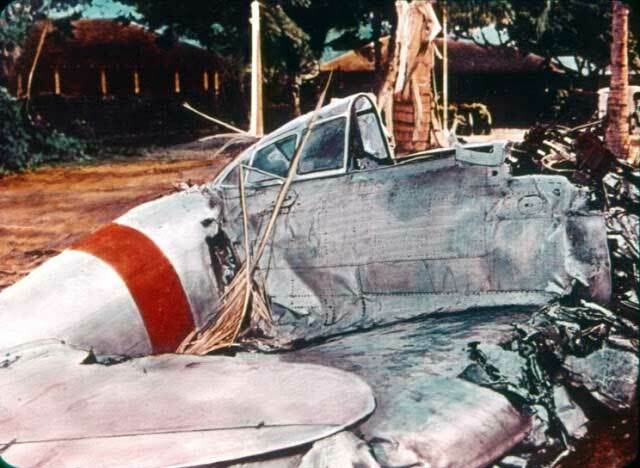 Some detractors like to claim that Wayne's old football injuries didn't prevent him from being a stuntman, which is true, but Wayne was no longer a stuntman by 1941 and had other ailments. Wayne likely knew that he would need a special dispensation to get into the military, so he worked it from that angle. In any event, not making every last effort possible to join the military is not “avoiding service.” Again - there was nothing to avoid, as John Wayne was never drafted. John Wayne promo photo for "The Big Trail" (1930). There is evidence that Wayne’s studio, however, did do its utmost to prevent Wayne from serving. Herbert Yates, the President of Republic Pictures, Wayne’s studio, threatened to sue Wayne for breach of contract if he enlisted. The implied threat was that Yates would blacklist Wayne. 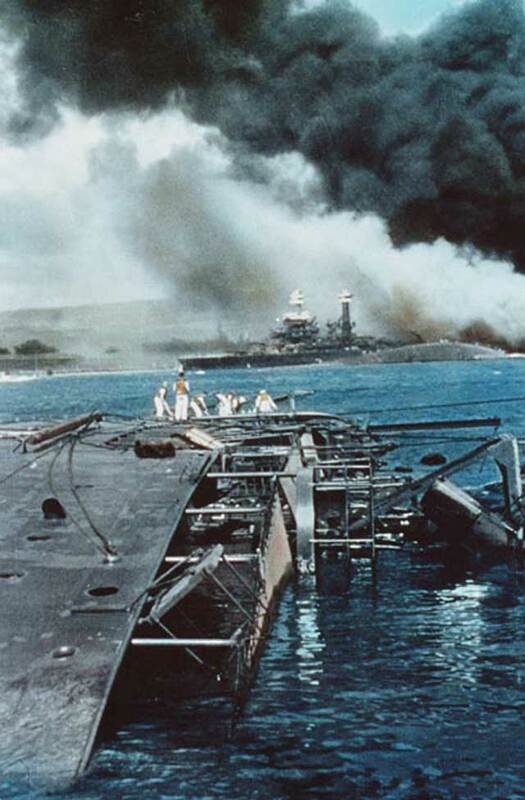 At that time, Commander John Ford, USN, tried to get Wayne into his naval film unit, but the military imposed a hiring freeze on it and that never happened. 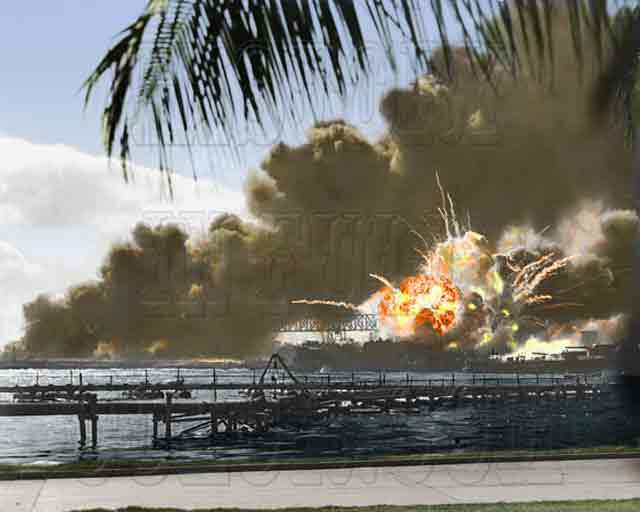 Wayne sent in the paperwork to enlist in the naval photography unit, but was never called. In any event, Wayne was not drafted even after being reclassified 1-A, so he had nothing to avoid - the issue of avoiding being called up simply never arose. The studio was acting in its own interests, not at Wayne’s behest when it tried to prevent Wayne from serving. There is a lot of evidence of Yates' campaign to prevent Wayne from abandoning his film contract. 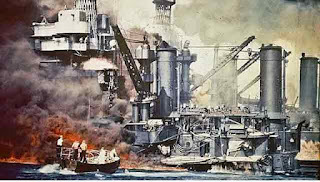 In 1944, Wayne received a 2-A classification, “deferred in support of [the] national … interest.” The military evidently felt that Wayne could do more for the war effort outside of the military than in it. 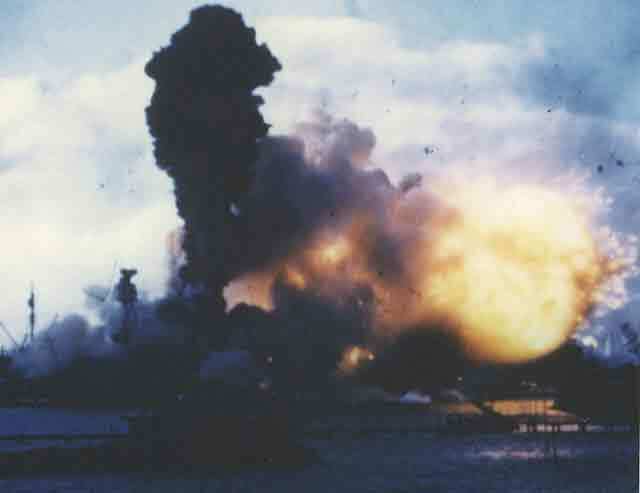 About a month later, the Selective Service decided to revoke many previous deferments and reclassified Wayne 1-A. However, Republic appealed and got Wayne's 2-A status reinstated until after the war ended. Yates knew that John Wayne was keeping the studio in business, employing a lot of people and creating patriotic pictures. The draft board agreed. 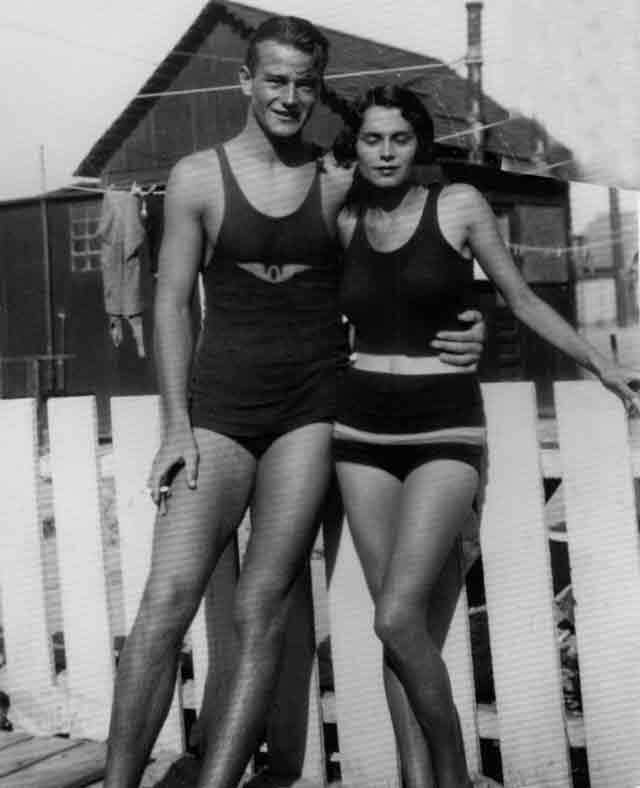 John Wayne with first wife Josephine Alicia "Josie" Saenz at a Southern California beach, 1932. 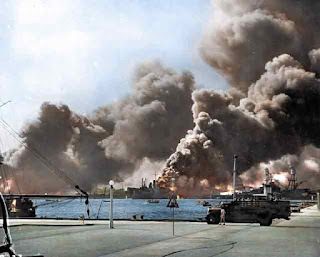 Let’s look at what John Wayne actually did during World War II and see if that means anything. 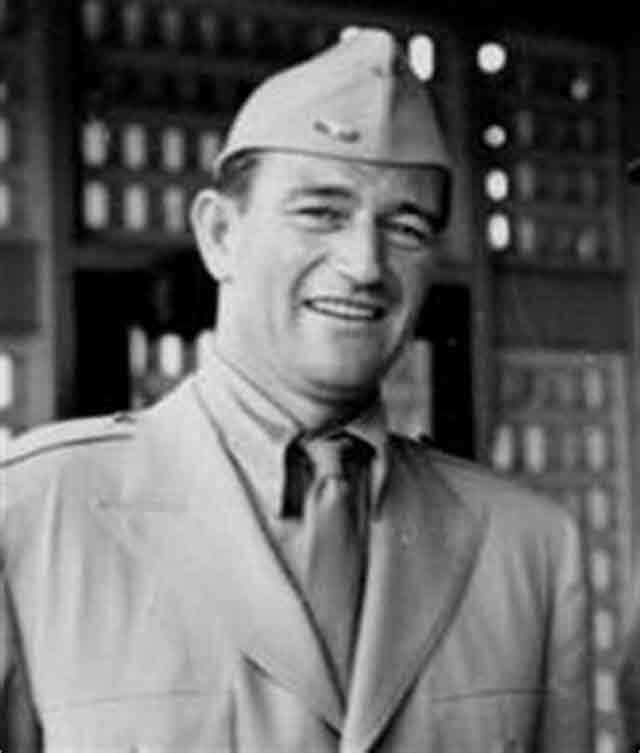 John Wayne toured forward U.S. bases and hospitals in the South Pacific for three months in late 1943 and early 1944. Wayne did this during his personal time off in between satisfying his contractual duties for Republic. He entered forward areas during this time and was allowed to wear a uniform while doing so (which means, incidentally, that claims that Wayne “never wore the uniform” are simply false - he did, and not just in the movies). Bob Hope was made an “Honorary Veteran of the United States Armed Forces” by Congress for similar activities (though Hope did it far more extensively). 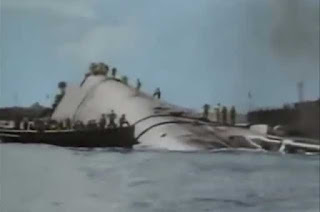 Morale-building was hugely important during World War II, especially in reassuring the Australians that the United States would be there for them through thick and thin, Not everyone could do it. John Wayne could and did. That is why Washington had told California draft boards to go easy on prominent actors. 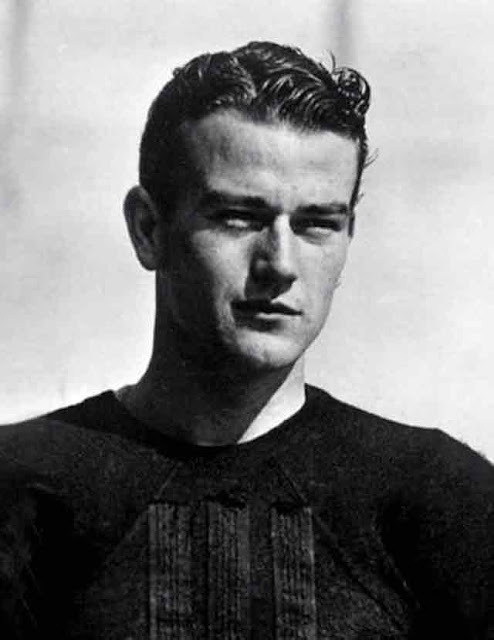 John Wayne while on the USC football squad, the 1920s. Mickey Rooney, who was drafted, got a Bronze Star for doing similar work entertaining the troops. Mickey Rooney is “good” because he performed after he was drafted, but John Wayne is “bad” because he performed despite the fact that he wasn’t drafted is what it apparently comes down to for some folks. The distinction makes no sense. In fact, doing that kind of work voluntarily rather than being forced to do it by being drafted is the more noble path. Mickey Rooney did his duty and was proud of it, and John Wayne did his duty and was proud of it. If Wayne had been drafted and Rooney not drafted, their roles would have been reversed. They both still would have served their country in their own ways. The full photo of the one at the top of this page (State Library of Queensland). Any veteran who is being honest will tell you that you don’t get a choice when the US Army decides what you should do - you do it. If the US Army wanted John Wayne to serve, he would have served. Wayne helped the Army despite not having to lift a finger for it. John Wayne did not attempt to avoid serving in the US military during World War II. To summarize: John Wayne was never drafted, and never tried to avoid being drafted. Wayne may not have gone to extreme and self-sacrificing lengths to try and enlist, but that might not have worked anyway due to his ailments. Wayne did try to join the military through back channels that would have overcome his physical limitations, but that did not work. 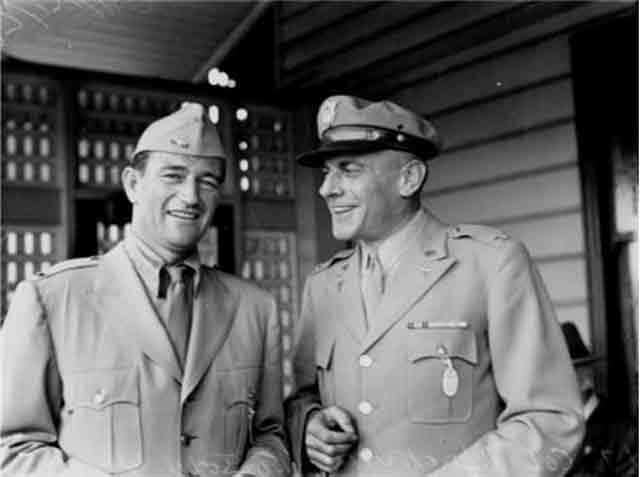 John Wayne did voluntarily engage in morale-building visits to forward areas at his own risk. 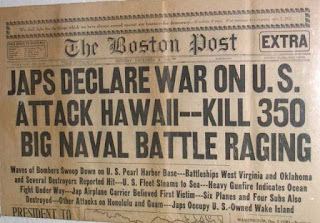 John Wayne was not a draft-dodger and did what could be reasonably expected of someone in his situation to aid the war effort. 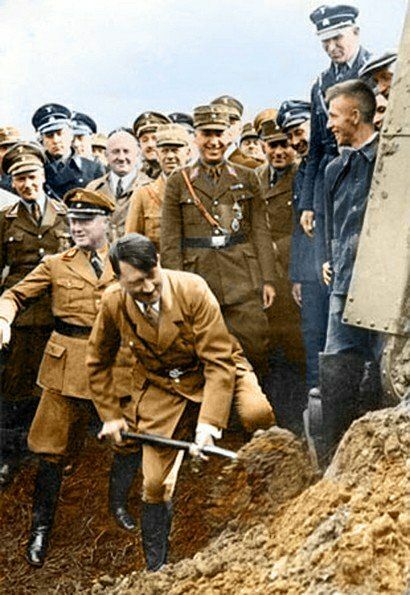 Hitler at Frankfurt doing a ceremonial scoop of dirt for the first Autobahn. 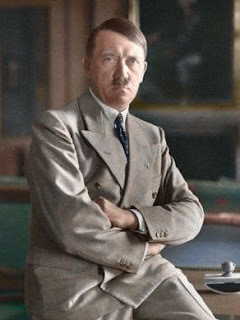 This page has color pictures of Adolf Hitler. 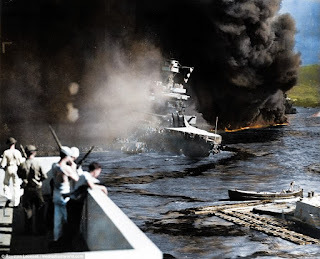 As with all the pages on this site that include color pictures, there are no assurances of guarantees that any of these pictures are original color pictures unless noted. You may assume that any picture not indicated as an original color picture has been colorized by experts at photoshop. The artists who colorize pictures typically "sign" them with some kind of watermark, which you may notice. 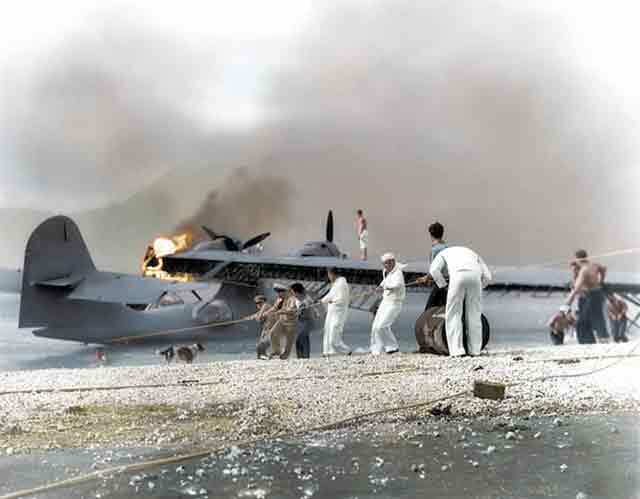 I have no issues with presenting colorized photos so long as they make a sincere effort to mirror real-life colors and the job is done tastefully. Hitler at one of his favorite lookout spots on the Obersalzberg in 1943. 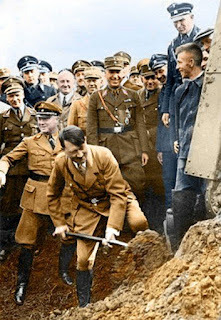 This is a closeup of a larger shot that includes Joseph Goebbels. 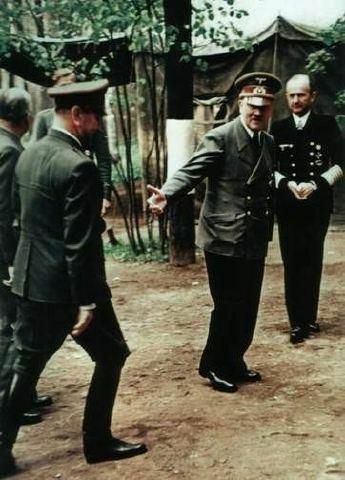 Adolf Hitler toward the end of World War II. Note that he is clutching a piece of paper in his left hand and clenching his fist with his right, these are tricks that Parkinson's disease patients typically use to control and hide their trembling. I have seen this identified as being from Spring 1944. Perhaps it is, but it looks later than that to me. Hitler at the Mönichkirchen train station outside his command train (Sonderzug) Amerika (name later changed to Brandenburg). Visible are, from left to right, Dr. Theodor Morell, Gerhard Engel, and Dr. Karl Brandt. Hitler had a field headquarters at Mönichkirchen and stayed at a hotel there (called the Mönichkirchnerhof) in April 1941 for 14 days, from 12 April to 26 April. 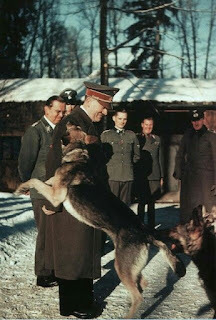 In fact, Hitler celebrated his 52nd birthday at Mönichkirchen. 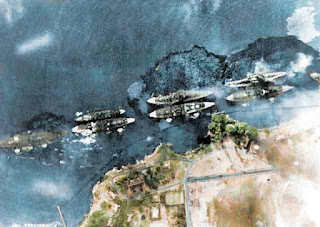 Hitler was there to follow the progress of the invasions of Yugoslavia and Greece, both of which went exceedingly well. 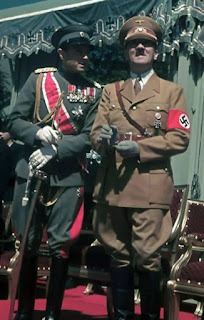 Adolf Hitler on June 2, 1939, with Prince Regent Paul of Yugoslavia. They are reviewing a Wehrmacht parade in Berlin. Hitler worked very hard to woo Paul and ultimately succeeded, but the Yugoslavs deposed him and Germany had to invade anyway. 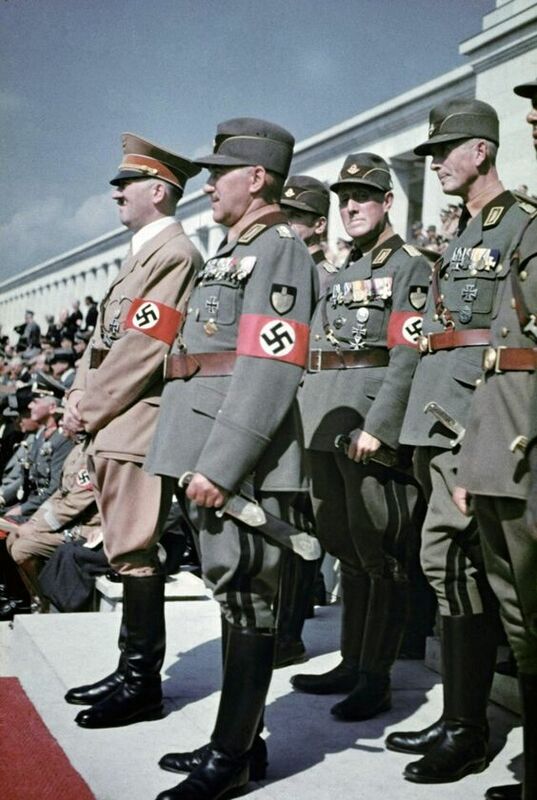 Hitler and leaders of the Reich's Labor Service gather on the main forefront of the Zeppelinfeld Nürnburg Rally site (you can see the distinctive facade behind them). 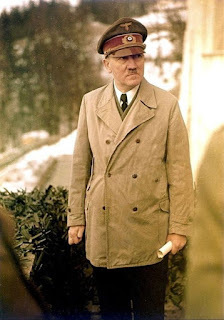 Hitler wearing his famous long leather trenchcoat. Some people claim that this is a blue trenchcoat, but that may just be a trick of the lighting. Other color pictures of the era tend to show black leather as a light blue in direct sunlight. I have seen other trenchcoats worn by senior Wehrmacht officers that appear blue, but that is unlikely to have been the case in real life. 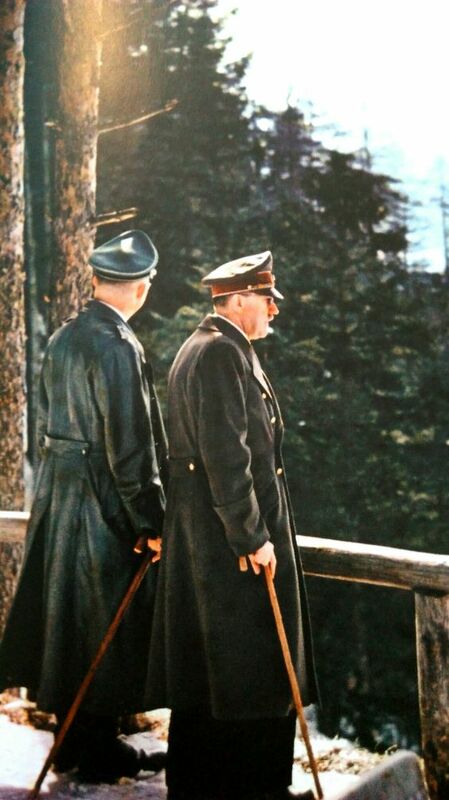 Hitler with Heinrich Himmler on the Obersalzburg in early 1944. Hitler walked on this path daily when in Berchtesgaden. The British had a plan to assassinate him from those forests in the distance, Operation Foxely, but the war proceeded to its conclusion before it came to fruition. If the operation had been hurried forward, conceivably Hitler could have been shot at the moment this picture was taken because this was the spot chosen to do it. 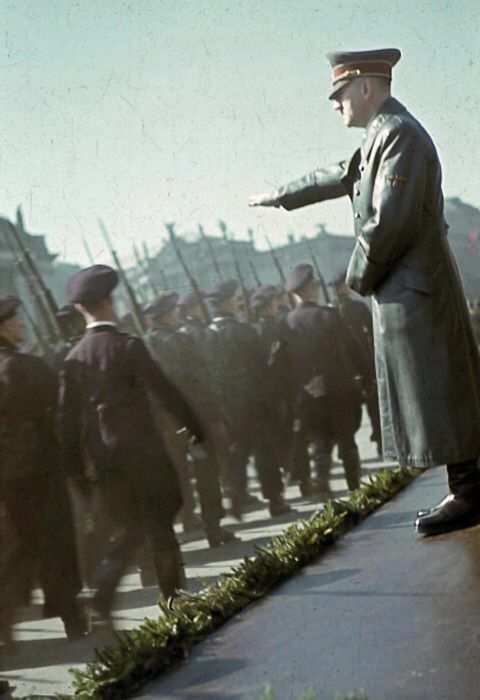 Hitler reviewing a parade of Kriegsmarine soldiers. 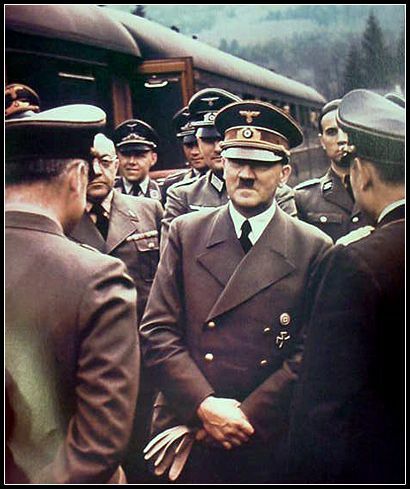 Holding your arm out like that for lengthy periods of time is not easy, but Hitler was fanatical about presenting a strong image. 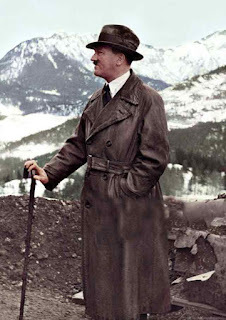 Hitler loved to go on hikes in the mountains. In fact, this was something that he did as a young man in Vienna just as much as later in Berchtesgaden. He would go up in the nearby mountains and talk about his love for opera, a lifelong passion. 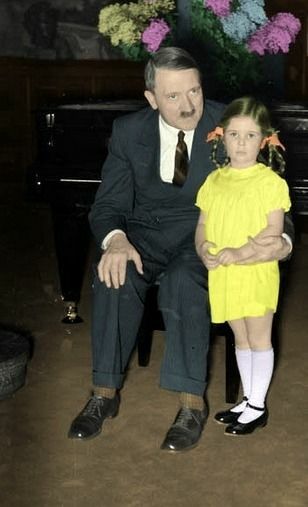 Hitler loved to pose with children, particularly young girls and even babies. 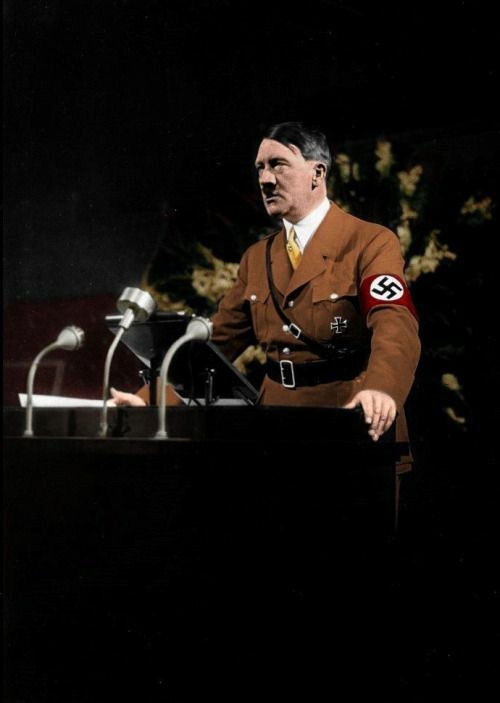 A key part of Hitler's political base were women fully indoctrinated into the party via the BDM and labor organizations. Appearing as a warm daddy-type was a carefully crafted part of Hitler's public image. There were a lot of these pictures. In fact, Hitler had a local little girl pose with him for many such pictures in Berchtesgaden until someone found out that she was Jewish. 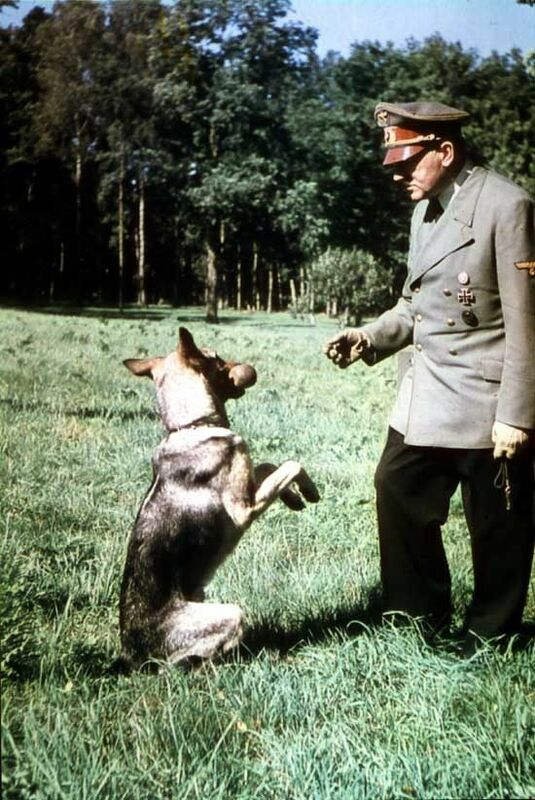 Hitler playing with his dog. 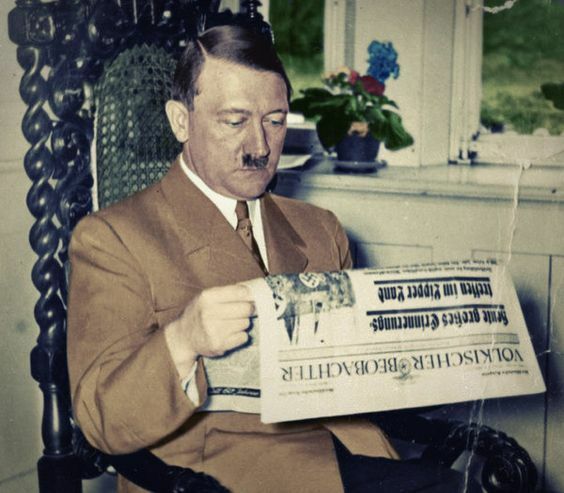 Hitler reading his Völkischer Beobachter (which roughly translates as "People's Observer"). This was the newspaper of the National Socialist German Workers' Party (NSDAP) and was seen as the "voice" of Hitler. It was banned during Hitler's imprisonment in Landsberg Prison from November 1923 to February 1925, when Hitler successfully relaunched the NSDAP. The Völkischer Beobachter paper was purchased from The Thule Society in December by Major General Franz Ritter von Epp, perhaps using secret Army counterintelligence funds. Hitler acquired all of the shares of the newspaper in 1921. The NSDAP's posters for rallies almost always contained references to Völkischer Beobachter. Its publication continued right up to May 1945, though the final issues were not distributed. 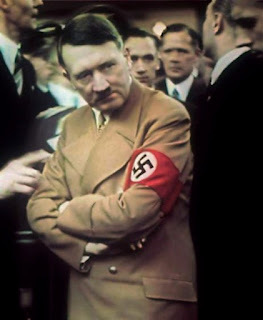 To the extent that Hiter needed a personal income, which of course he did not after 1933, the Völkischer Beobachter could have provided a nice livelihood for him all on its own. Adolf Hitler at the International Auto Exhibition in Berlin in 1939. As I've shown in another article, Hitler was a real gearhead when it came to cars and loved to see the latest advances in bodies and motors. I can't find a date or place for this photo. 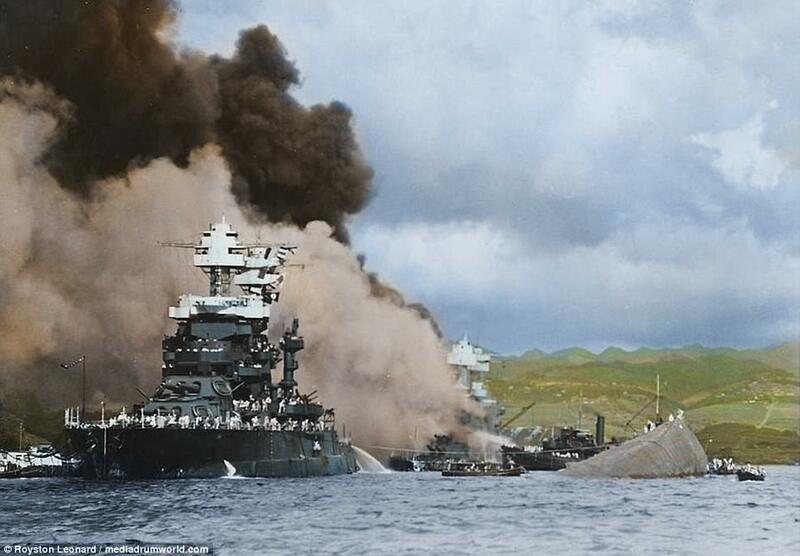 It looks mid-war to me, perhaps 1943. 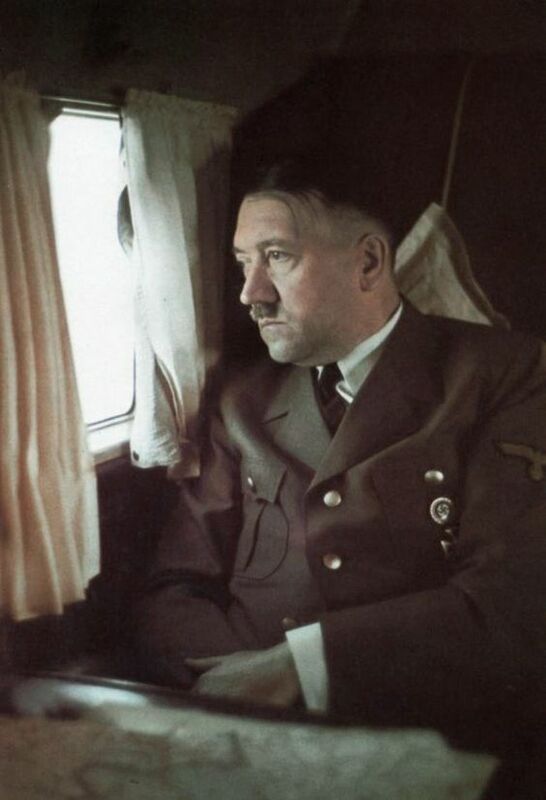 A portrait of Adolf Hitler in 1933. Hitler's preferred business suits in the early 1930s, but gradually worked uniforms into his clothing choices until he wore them almost exclusively by the middle of World War II except on very rare occasions, such as the wedding of Eva Braun's sister in early June 1944. This is an original color image of Hitler taken by Walter Frentz. This is aboard Hitler's personal Focke-Wulf Fw-200 Condor, which Hitler used throughout World War II until it was destroyed in an Allied bombing raid on 18 July 1944. Hitler with his pet German Shepherd, Blondi. 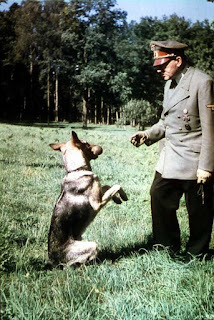 Hitler would poison Blondi right before he died. Hitler and Paul von Hindenburg at an August 1933 Memorial Celebration at the Tannenberg monument. 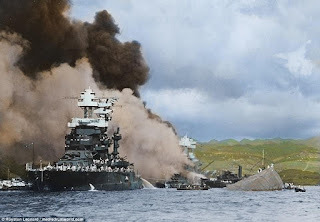 This is very personal to Hindenburg because it is celebrating Hindenburg's great 1914 victory there against the Russians with Erich Ludendorff which made him a German hero. Speaking of whom, note that Ludendorff was not invited, Hindenburg and Ludendorff disliked each other following the latter's breakdown during the last weeks of World War I. In fact, Ludendorff ran against Hindenburg in the presidential election of 1925 but only got 1.1% of the vote. 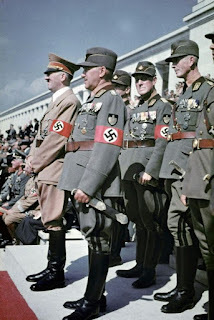 Ludendorff was so humiliated by that and other things that he even refused to stand next to Hindenburg at the 1927 dedication of the Tannenberg monument. Ludendorff also had marched with Hitler during the 1923 Putsch - the soldiers refused to shoot Ludendorff, who simply continued walking forward as everyone else walking beside him fell and ultimately just strolled through the line of soldiers doing the firing. 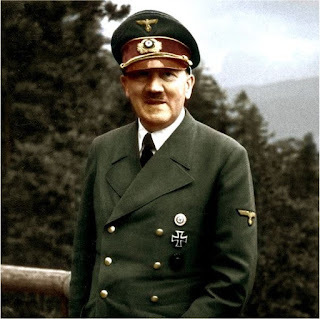 While Hitler was in jail, Ludendorff got involved with other parties similar to the NSDAP, and that apparently ended his and Hitler's relationship because Hitler hated political rivals. Anyway, back to this photo. On the other side of Hindenburg is Hermann Goering busying himself with something or other. One can feel the awkwardness of all three men in the front row. 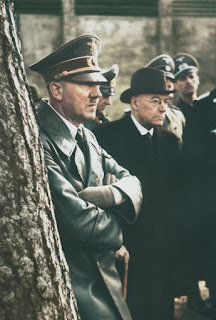 Former Chancellor Franz von Papen is standing behind Goering. Someday, someone is going to claim that Goering is a time traveler due to that narrow briefcase he has on his lap which looks like a laptop. 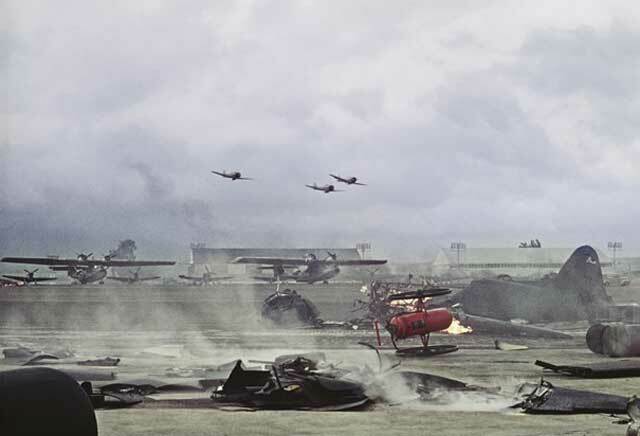 However, if Goering was from the future, he sure made a hash of things in 1940 against the RAF. Just like in "Star Trek," different colored uniforms symbolize different military/paramilitary groups in 1930s Germany. Brown denoted Sturmabteilung(SA), black was worn by the Schutzstaffel (SS), while field green was worn by ordinary Wehrmacht (Heer) soldiers. Hindenburg is wearing a pointy hat called a Pickelhaube. It is of Prussian design and went out of fashion after World War I, but Hindenburg is wearing his old uniform. The Pickelhaube was replaced during World War I by the Stahlhelm, a much more efficient, safer, modern, and cheaper helmet. Note Hitler's top hat resting in his lap, as far as I know, Hitler only wore that a few times in 1933 with Hindenburg, who was quite formal. Hitler could have worn his old World War I uniform if he wished, but it would have been a corporal sitting next to a Field Marshal, and that just wouldn't do. 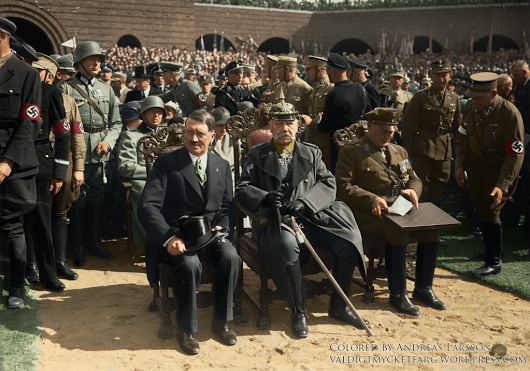 Adolf Hitler at the 1939 Day of German Art. 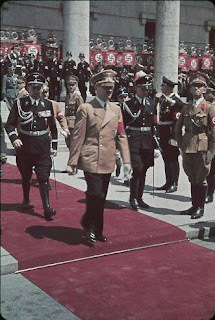 He is with his elite Leibstandarte-SS Adolf Hitler bodyguards. Max Wünsche is in the black SS uniform at Hitler's left following him. 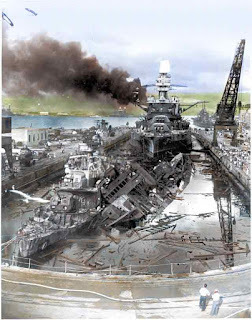 Captured by the British in Normandy, Wünsche passed away in 1995. 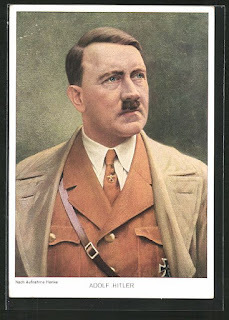 A German postcard of Adolf Hitler as Reich Chancellor. 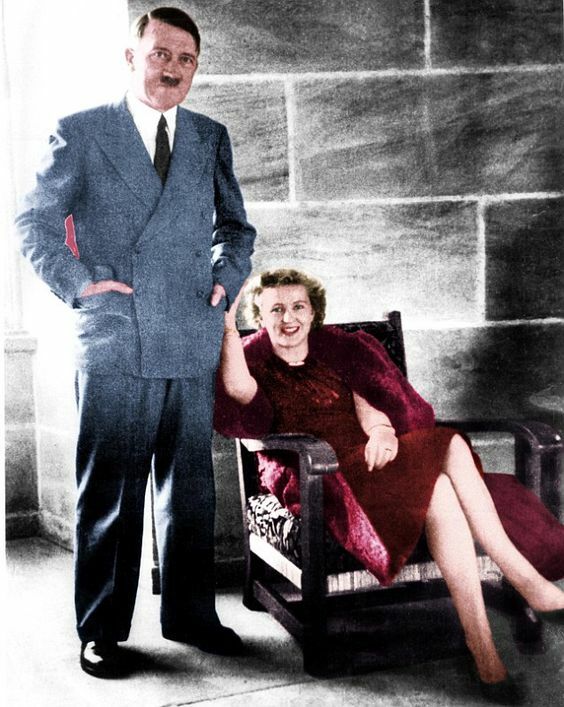 Adolf Hitler with future wife Eva Braun. This is in early June 1944 at the wedding of Eva's sister to the unfortunate Fegelein. The reception was held at the Eagle's Nest, one of seven times that Hitler is known to have visited it. Croatian ally Ante Pavelic, left, meeting with Adolf Hitler on September 18, 1944. 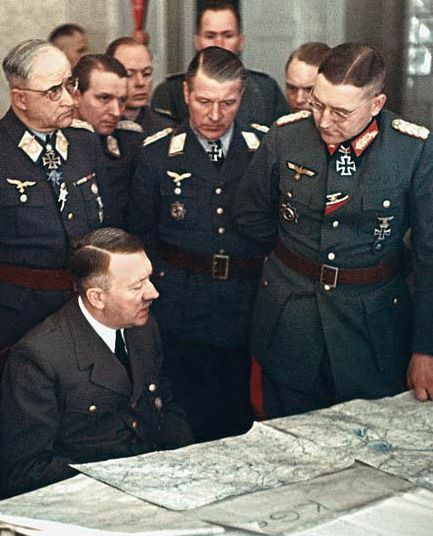 Adolf Hitler at the map table with General Busse, commander of Ninth Army. They are planning the defense of the Oder and Berlin. 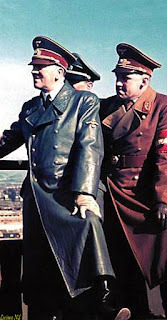 Max Wunsche, Adolf Hitler and Karl Brandt. 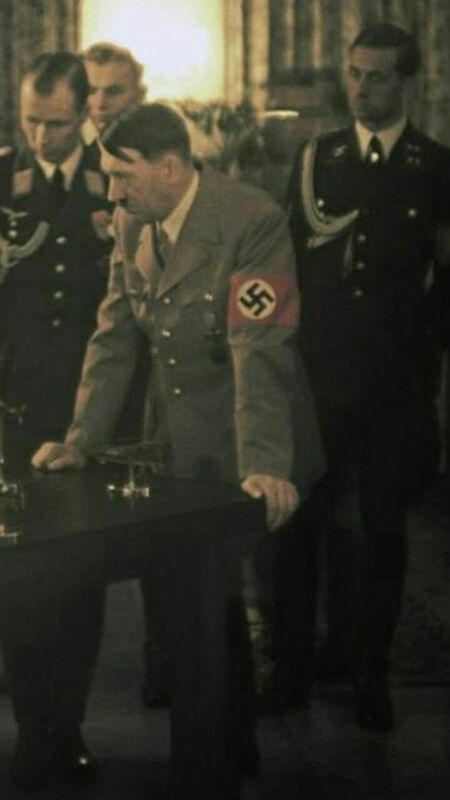 Adolf Hitler at the lectern at the opening of the party congress in the town hall of Nuremberg in 1935.